For our most recent blog, which showcases our Fall-Winter Arizona Geology e-Magazine article, "Arizona Geology e-Magazine touts new earth fissure maps", visit our new digital site: http://blog.azgs.arizona.edu/blog (/ 29 November 2017 /). 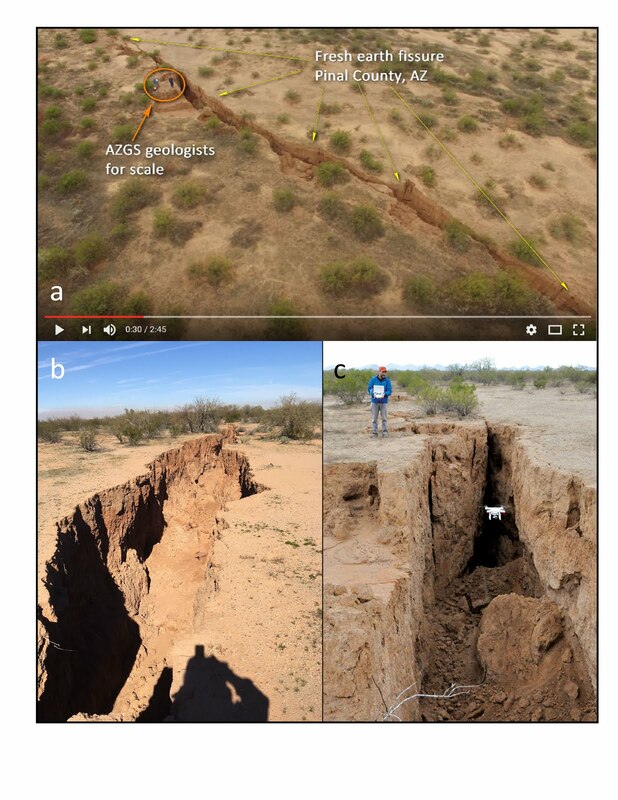 By way of preview, "Oddly enough, Arizona has an earth fissure season; a season when fissures are more likely to first appear or undergo renewed activity. Our Fall-Winter Arizona Geology e-Magazine presents revised earth fissure maps for parts of Cochise, Maricopa, and Pinal Counties, as well as case studies of one new (Tator Hills) and one reactivated fissure (Apache Junction)." The e-Magazine article includes 5 figures. Shown below is the fresh Pinal County earth fissure. Our newest post on the recently released, and magnificent, 'Utah Earthquakes (1850–2016) and Quaternary Faults' map by Steve Bowman (Utah Geol. Survey) and Walter J. Arabasz (Univ. 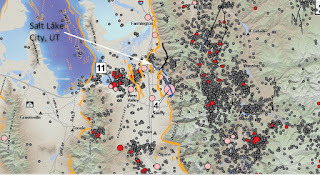 of Utah Seismic Stations) is available at our new blog site. Image: Zoomed into the faults and earthquakes near Salt Lake City, Utah's largest metro center. Andrew Zaffos in the center. 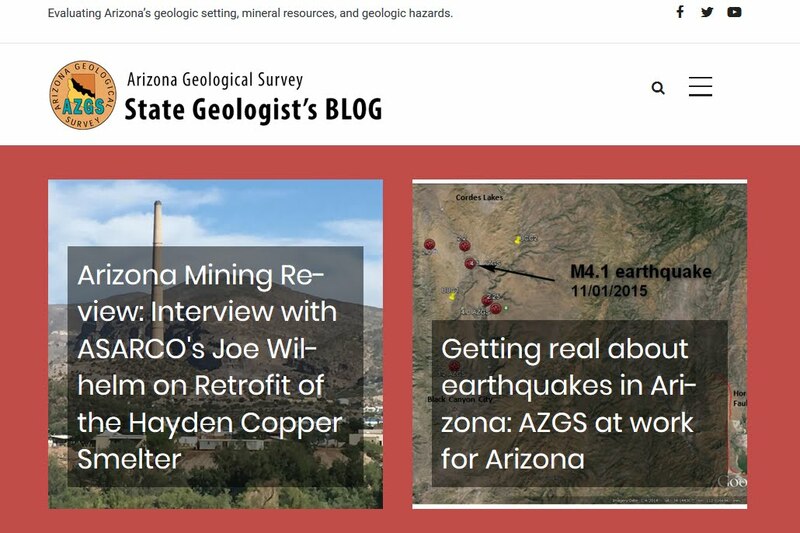 After 10 years and more than 4,000 blog posts (and more than 1-million views), the Arizona Geological Survey’s State Geologist’s Blog has moved to a fresh, more attractive web environment: http://blog.azgs.arizona.edu/. When Lee Allison, former Arizona Geological Survey Director (now deceased), published his first post, Arizona lives and dies by its geology, on Monday, 1 January 2017, he could not have known that by October 2017, the blog site would be populated by 4,340 posts, more than 4,200 authored by Lee. We are not moving to this new sight lightly, but this new space provides more functionality and an opportunity to build a stronger dialogue with our readers. Over the next several months, we plan to migrate all 4,340 posts from Lee’s original site to this new site. 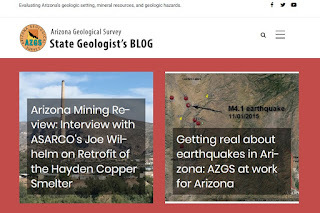 Please join us at our new site http://blog.azgs.arizona.edu/ for frequent and telling updates on the state of Arizona’s mineral resources, new geologic maps and reports, and for geologic hazard assessment and analysis: landslides, floods, earthquakes, debris flows, earth fissure, radon, and more. AZGS STATEMAP 2017 deliverables: Delivered! We just delivered geologic map data for four 7.5’ quadrangles to the US Geological Survey as part of our 2017 STATEMAP work – see the list below. Before releasing the map and GIS database publically, the authors will make any necessary revisions, polish the map appearance and the legend for consistency with AZGS standards. Delivery of draft maps to the USGS program managers is required at the end of each contract period; grant funding for the next STATEMAP projects depends on this. All participating state geological surveys submit draft maps, then clean and polish them before releasing them to the public. For the AZGS, it has typically required 6 to 15 months to finalize and release the maps, as this work is done while the geologists are also working on the next mapping projects. Meanwhile, the geologists are gearing up for the next field season, which begins later this fall or early winter. Since 1992, AZGS has participated in the U.S. Geological Survey’s STATEMAP. To date, AZGS has received ~ $4M in federal funds, matched $ for dollar by state funds, for a total of $8 M. AZGS geologists meet annually with Arizona Geologic Mapping Advisory Committee to identify high priority areas for new mapping. 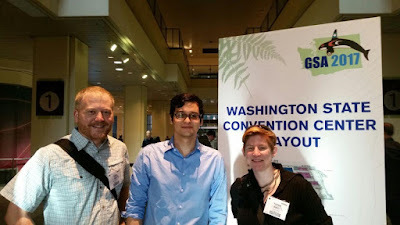 Our map advisory team plays a crucial role in helping select mapping that are particularly relevant to resolving challenging geologic, and often, socio-geologic problems. This past year, our mapping focused on quadrangles in SW and SE Arizona – see the map figure. The Dragoon area was chosen because it hosts porphyry copper deposits with substantial potential economic value. 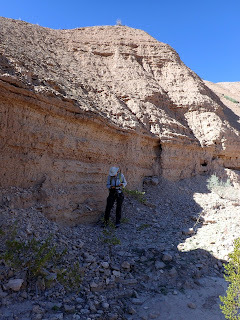 The Blythe and North Trigo Peaks quadrangles contain ancient river deposits that help us understand origin and evolution of the Colorado River, and North Trigo Peaks contains diverse and complex bedrock geology that sheds new light on Mesozoic and Cenozoic tectonism in the region. The ~½ of the Blythe quadrangle in California covers much of the late Holocene floodplain of the Colorado River. The surficial deposits there have been completely altered by agricultural and urban activity, but our collaborators with the USGS office in Flagstaff (Debra Block and Kyle House) used historical aerial photographs and early topographic maps to make a detailed geologic map of this area. The Gila River Valley near Safford contains the young river floodplain and multiple levels of terraces recording former river levels, and many great exposures of the basin deposits that are providing insights into how the river developed. 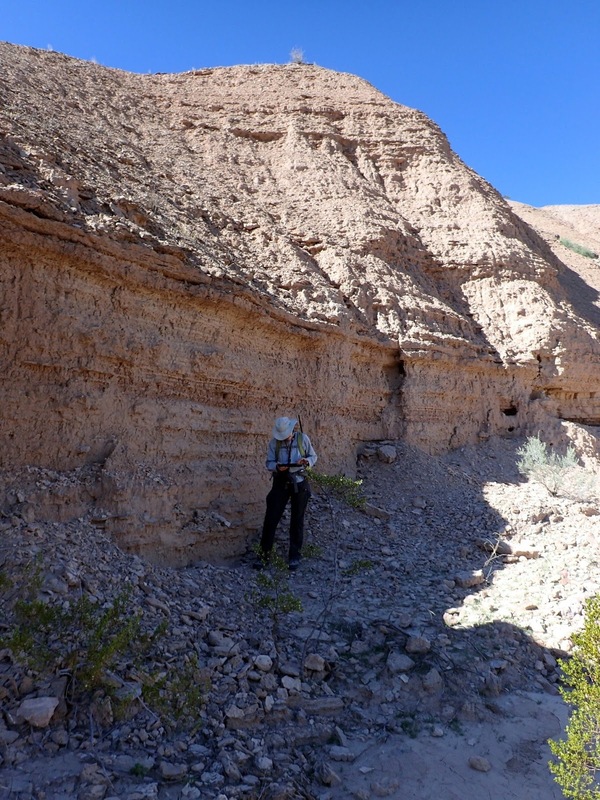 Image: Ann Youberg examining basin-fill sediments exposed along near Ft. Thomas. Meanwhile, later this year we’ll release static digital versions of the geologic maps and GIS data in a number of useful formats for the following map quadrangles. We will be meeting with our Geologic Mapping Advisory Committee in the next few weeks to determine priorities for the next mapping cycle, which will begin in September 2018. The proposal for this mapping is due to the USGS in mid-November. There are many interesting and important areas yet to map in Arizona! Over the past decade the Southwestern U.S. has seen a surge in the number and intensity of wildland fires. In Arizona, wildfire season overlaps with the annual monsoon, resulting in post-wildfire debris flows and floods that threaten life and property. 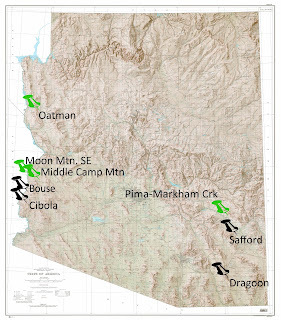 The Arizona Geological Survey just released a report identifying areas in Coconino County, Arizona, at risk from flooding and debris flows in the aftermath of a reasonable-wildfire scenario. This report was a joint research project with JE Fuller Hydrology and Geomorphology, Inc., with offices in Tucson, Tempe, Flagstaff, Arizona, and Silver City, New Mexico. 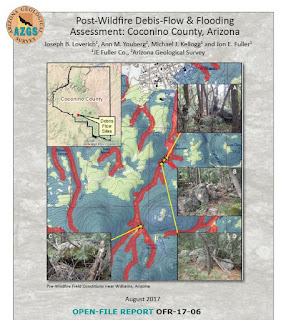 The 63-page report, ‘Post-Wildfire Debris-flow and Flooding Assessment: Coconino County, Arizona’, includes six appendices. The report and appendices are online and free to download from the AZGS Online Document Repository. According to first author Joe Loverich, this work can propel ‘forest health initiatives forward in these at risk watersheds’. This Thursday, Ann Youberg and Joe Loverich will be presenting some of their results at the Arizona Hydrological Society’s 30th Annual Symposium in Flagstaff. The research team conducted a county-wide reconnaissance evaluation, before focusing on two pilot-study areas: Fort Valley and the City of Williams. The report results integrate field studies, two-dimensional FLO2D pre- and post-wildfire flood modelling, and debris-flow probability, volume and runout modeling to provide risk maps and identify mitigation options and opportunities. Conversations to implement mitigation options are in progress. Citation. 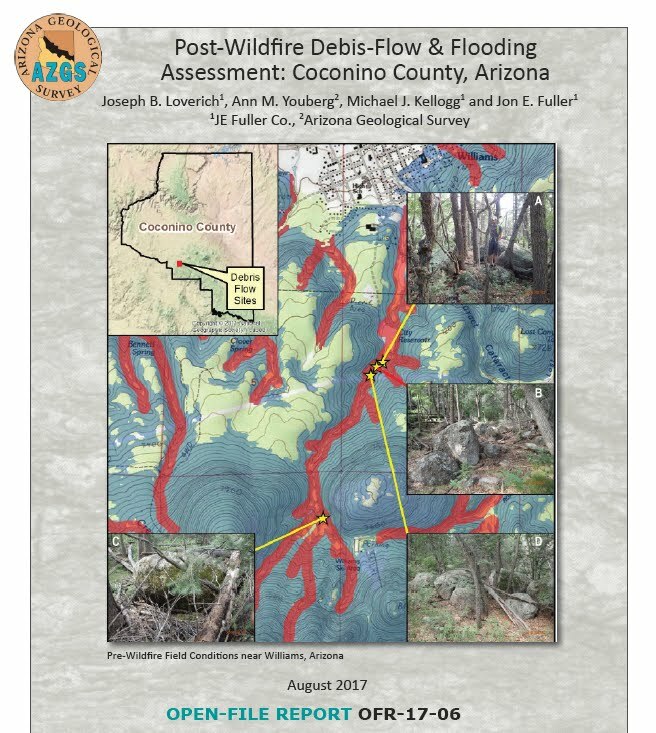 Loverich, J.B., Youberg, A.M., Kellogg, M.J. and Fuller J.E., 2017, Post-Wildfire Debris-flow and Flooding Assessment: Coconino County, Arizona. Arizona Geological Survey Open-File Report (OFR-17-06), 63 p., 6 appendices. Appendix A - Pilot Area Justification Memo, Kellogg, M.J., Loverich, J.B., Youberg, A.M. and Fuller J.E. Appendix B - Pre- and Post-Wildfire Hydrologic Modeling, Loverich[AY1] , J.B., Kellogg, M.J. and Fuller J.E. Appendix C - Pre-Wildfire Debris-Flow Risk Assessment, Youberg, A.M. Appendix D - Post-Wildfire Debris-Flow Modeling, Loverich, J.B. Appendix E - Post-Wildfire Debris-Flow, Youberg, A.M. Appendix F - Flood and Risk Zone Maps, Loverich, J.B., Kellogg, M.J. and Fuller J.E. Following a 15-month hiatus, the Arizona Mining Review (AMR) filmed and its 40th episode, Pozzolan mining in central Arizona, on 28 Aug 2017. The Arizona Geological Survey’s Geologic Extension Service launched the Review in Jan. 2013. With a few lapses, we released monthly episodes until May of 2016. In May, the Review went on hiatus as we moved from State Agency status to the College of Science at the University of Arizona. Plans to restart the program in Aug. 2016 were put on hold after host Lee Allison’s tragic death. We are now back in business and ready to explore and broadcast developments in Arizona’s mining and mineral industry. Project map for pozzolan at Kirkland Mine. The small mine in the low hills north of Kirkland encroaching on the southern edge of Skull Valley, Yavapai County, Arizona, has been worked on-and-off for more than 100 years. It’s seen half-a-dozen name changes to reflect changes in use of its mining products. In the 1950s, it was the Arizona Capital Mine, as cutters carved out dimension stone for the Arizona State Capital building. In the 1970s, it was the Kitty Litter Mine, as a more prosaic product was harvested. 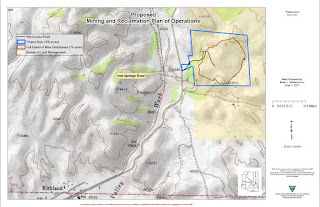 Currently, Kirkland Mining Co. president Areta Zouvas and project manager Al Burch are working with the Bureau of Land Management (BLM) to re-permit the quarry to mine pozzolan. (The Zouvas family has owned the Kirkland Mine claims since 1989.) An environmental assessment of the mine and environs, a requirement of the BLM, is underway and expected to take 12- to 18-months to complete. If approved, the quarry could open shortly thereafter. Pozzolan is a geologic material – a volcanic tuff or ash – that when admixed with water, lime, sand and gravel makes a superior and long-lived concrete. Pozzolan is named for the town of Pozzuoli in Italy. Two thousand years ago, the Romans mined pozzolan near Pozzuoli to enhance concrete of new buildings and pillars, some of which still stand today. 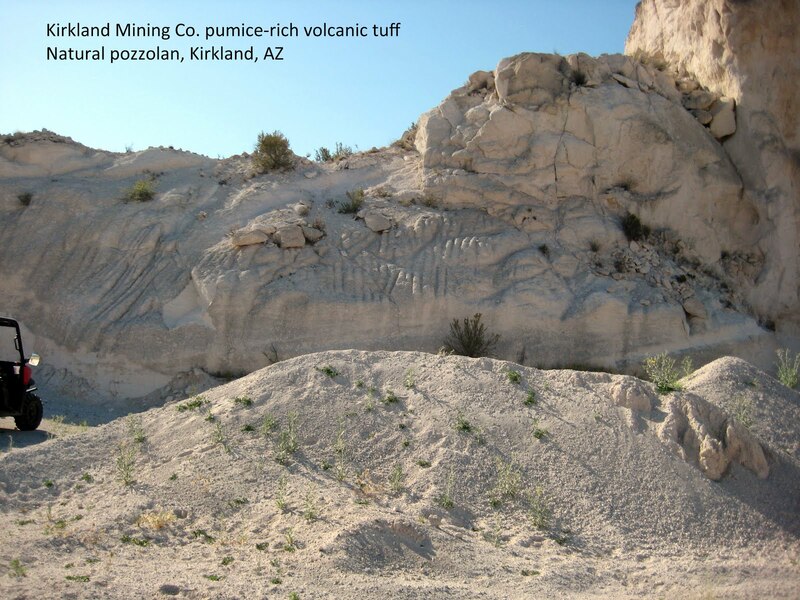 Kirkland’s pozzolan deposit is hosted in Miocene-age volcanic tuff. The tuff is a white to tan, massive crystal-lithic tuff in excess of 250 feet thick that dips gently to the northeast. Extraction of the tuff requires simple earth-moving equipment to quarry and crush the stone. The mine operators anticipate extracting ~500,000 tons of ore annually at peak production at an astounding 95% rate of yield for as much as 40 years. The resulting pozzolan mine will find a market in the western U.S., where it likely will be processed and sold as a Supplementary Cementitous Material (SCM) added to cement and concrete to replace or be blended with Fly Ash to enhance the durability and strength of concrete. 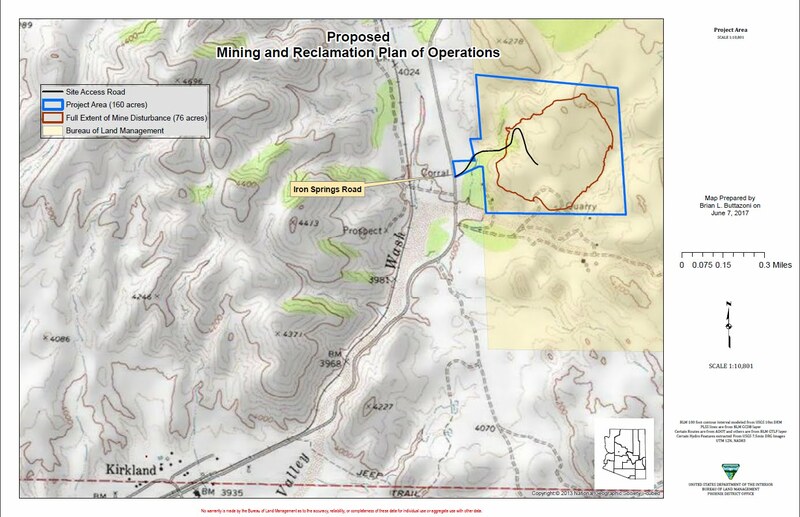 ‘BLM invites comments on ‘pozzolan’ mine in Skull Valley, Central Arizona’ Arizona Geology Blog post. BLM Resources – FAQs, Documents: Mine Process & Anticipated Equipment; Draft Mining and Reclamation Plan of Operations; Conceptual Mine Plan; Biological Evaluation, and more. How to get involved: Public scoping period. 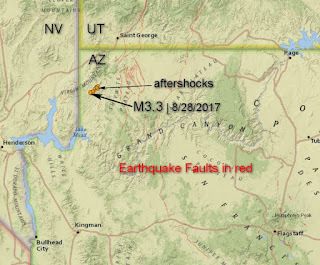 At 7:03 a.m. on 28 August, a magnitude 3.3 earthquake occurred in the northwest corner of Arizona about 20 miles SSE of Mesquite, Nevada. Seven smaller aftershocks followed on the heels of the initial event (Table 1, Figure 1). 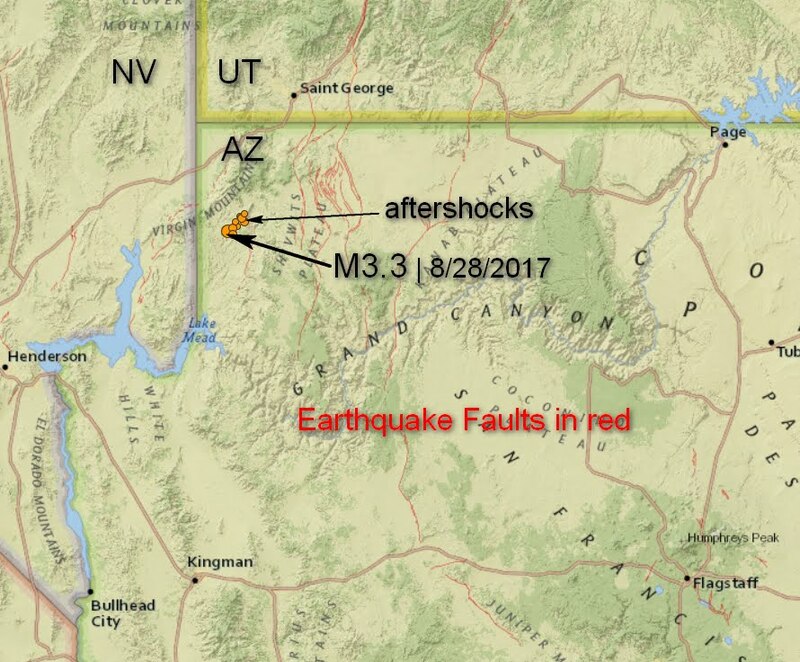 *Data derived from the Arizona Broadband Seismic Network by Jeri Young (AZGS).